A while back a chap in England named James Burke wrote a book called Connections. He sets out to prove that inventions stem from ideas, innovation and coincidences that reach critical mass at a point in time to unleash major technological achievements. This is a story of such an occurrence. It was warm day and I was sitting in the yard. Because of my lust for Ariel Square Fours, I had just finished reading the biography of Edwin Turner, the inventor of the Square Four. While reading I was drinking some beer too. When I'm thirsty and in a contemplative mood, I don't remove the six-pack plastic can keeper. I just start at the number one firing order and go until number six. Upon finishing the sixer, I causally tossed it to the side and continued reading. But something in my field of vision caught my attention. It was the empty six pack. It landed upside down and the cans lazily leaned over to from two rows of three cans in a Vee. "Hey, that was neat," 1 thought. "Wonder if I tried that a few times, would it land the same way?" Then Mr. Turner's spirit must have touched my head because it hit me! The Square Four engine has pistons in each of four corners. The triple Vee cans looked a lot like the cylinders of an engine, a Moto Guzzi engine to be exact, except that there were three rows of two, to make six. 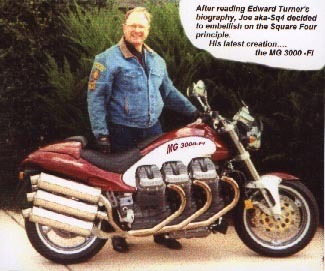 I thought, "Geeze, I wonder if you could harness the power of three Guzzi engines. Could I carry on the Edward Turner tradition of exemplary creative engineering genius? I mean, make a rip snortin' rev line screaming, tire burin' street racer that would scare the begeebers out of the Greenville Avenue crowd and have Dr. StrangeMotor (Daryl Bane) stand up and take notice. Sure I could, I built the WhoDat! So it began. I managed to find a couple of Centauro engines; 4 valve, 1000cc fuel-injected and ready to go. A little drawing, cutting and welding and before I knew it, there it was. The MG-3000-FI. At first I had her fitted with Borla silencers, but the TEDENOP (Texas Department of Noise Pollution) issued a restraining order on the bike and said it could be run only on roads west of Abilene and east of Pecos. Well that makes for a long trailer haul so I fitted some stock silencers. While legal action isn't a problem anymore, it did take some off the top end. On the dyno the MG 3000-FI produces an adequate 278.5 hp at the rear wheel. Maximum torque occurs at 6000 rpm, however the instrumentation on the dyno broke so the actual figures are unknown at this time. Top speed in fifth gear is a respectable 197.5 mph. There she feels like she's just lopin' along. I'm still sorting a few functional issues. For instance, the 3.5-gallon tank is a bit small for cruising. Consumption has to be improved above the 15 mpg rate. It's a little better if I use premium. Idling is fairly smooth, although from a dead stop you have to ease the throttle so she doesn't rotate over. The Weber fuel injection system needed some tinkering. I tried stock and performance chips. Will Creedon, the Guzzi chip expert, says he's up to the task. His approach is to use a 600 MHz Pentium MK-II chip. I know it sounds like a lot of processing power but Will assures me that it's the way to go. He'll give the MG 3000-FI fuel mapping for any load, terrain and altitude on earth. All I'll do is use the voice activated command and say where I'm at and presto - exact fuel mixing. The suspension is stock White Performance. However I had to crank up the damping and spring pre-load to the maximum positions to settle her down, especially on hard acceleration and braking. While the brakes were over-built and perfect for the stock Centauro, for the MG 3000-FI I had to replace the DOT 4 fluid with silicone. So far the gel-cell battery is holding up, but I wouldn't want to bump start her. Tires are a weak spot at this time. Goodyear said they'd work up a compound that should yield at least 1000 miles before replacement. That's a lot better than the 200 miles currently available in the Pirelli Dragons. I also need to do something about wind protection without affecting the voluptuous and sensuous lines of the Goose. Above 130 mph it feels like my head is being pulled off my shoulders. This hurts since the chin strap gets real tight and I almost pass out. For the time being I'm taking Ernie Maynard's advice and use the KISS principle. I attached a small sized shed hasp to my helmet. Then I ran a light gauge chain through the hasp and around the handlebars. After mounting the bike and setting the proper helmet to bar distance, a small padlock is run through the links. This actually works fairly well; no whiplash and I like the various adjustment lengths. I'm real pleased with the MG 3000-FI's performance and handling. This project turned out to be everything I expected. Edward Turner, thanks for the inspiration. Dr. StrangeMotor, eat your heart out. See you on the Green! !